Portrait of Countess Markievicz unveiled at Westminster. A portrait of the first female MP elected to the British parliament, Sinn Féin's Constance Markievicz, has been unveiled at Westminster, 100 years on from her election. The portrait was unveiled this week as part of the commemorations of the 100th anniversary of women being allowed to vote in Britain. It was presented to the Speaker of the British House of Commons, John Bercow, by the Ceann Comhairle of the Dáil, Seán Ó Fearghail. Countess Markievicz was elected to the British Parliament in 1918, the first women to be elected to the parliament, after being returned in the Dublin St Patrick's district but did not take her seat in line with Sinn Féin's abstentionist policy. 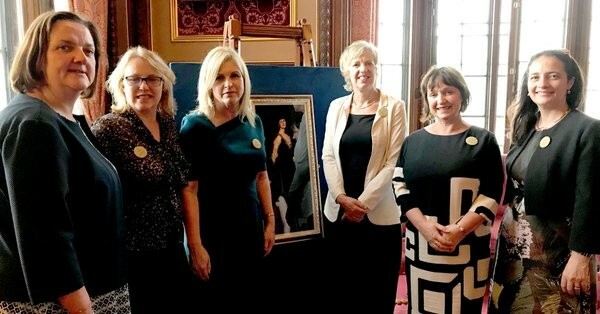 Sinn Féin's Senator Rose Conway Walsh and Michelle Gildernew MP attended the unveiling of the portrait in Westminster last night. Senator Conway Walsh said Countess Markievicz continues to inspire 100 years later. "I am delighted to be here to honour, for the first time, the amazing achievement of Countess Markievicz in the institution to which she was elected yet refused to take her seat in, honouring her election pledge. Out of 17 women candidates that stood in the 1918 election Countess Markievicz was the only successful one. In winning her seat Countess Markievicz sent a message that even though women only had limited suffrage they would not be bystanders to the political process and the process of change," she said. Michelle Gildernew said today's generation of Sinn Féin MPs carry on the work of Countess Markievicz. “As the second female Sinn Féin abstentionist MP elected to Westminster, I am delighted to be here today to see Countess Markievicz recognised and celebrated as the first female MP elected to Westminster. Constance Markievicz was a revolutionary, a feminist, a socialist and an abstentionist Irish MP. I am profoundly grateful to carry forward her radical political and social agenda," she explained.